. إن الخدمات الممتازة وحسن الضيافة العالي في Cairns City Backpackers تجعل إقامتك تجربة لا تنسى. يمكن للنزلاء الاستمتاع بالميزات التالية: تسجيل وصول/خروج سريع, تخزين الأمتعة, واي فاي في المناطق العامة, صف السيارات, التوصيل من وإلى المطار أثناء إقامتهم في هذا المكان الرائع. ادخل إلى واحدة من الغرف 20 وتخلص من عناء نهار طويل بمساعدة مجموعة كبيرة من الخدمات كمثل اتصال لاسلكي بالإنترنت, غرف لغير المدخنين, مكيف هواء, مكتب, مروحة الموجودة في بعض الغرف. إن مسار جولف - ضمن 3 كم, حمام سباحة خارجي, حديقة هو المكان الأمثل في الفندق للاسترخاء وتفريغ طاقتك بعد نهار طويل. استمتع بخدمات لا يعلى عليها وعنوان ذو اعتبار في Cairns City Backpackers . يُرجى العلم أن مكتب الاستقبال مفتوح من الساعة 07:30 صباحًا إلى 12 ظهرًا، ومن الساعة 04:30 عصرًا إلى 8 مساءً. No problems with the stay overall, you get what you pay for (bugs, mould in room, dirty furnishings etc) The problem was when we checked out and our key deposit was not in their deposit book. The lady at reception assumed we didn't pay a key deposit but it's not our fault the staff didn't put the money in the correct place! So it looked like they had no record of taking our money. She called the manager who was happy to send us away without our $20! We pushed them a bit more and after she spoke to the manager once more I guess they were ok to give it to us. Very disappointed with this interaction. Its fine if theres some mistake but to actually take our money is not acceptable. If you stay here, make sure you get a receipt!!! I stayed with my friend in double room. We were two, but there was only one plug. There was another, but I had to pay for it because it was air conditioner plug. Also, location is not so close from the city, whatever kind of pick up you want, they come earliest to pick you up and latest to get you back. سرير في غرفة صالة نوم مختلطة تضم 6 أسرّة. We only stayed the one night and that was enough. Nothing horrific just a series of things that could have been better. The shower in our room dripped all night which nearly drove me mad (I reported it as we left, the guy didn’t seem to think it was an issue). The shower wasn’t very clean. The location isn’t great. Not terrible but there are a lot better backpackers in Cairns. The cat in the hostel is so so so cute that playing with her was my favorite thing when I stayed in there. Very cheap，good money saving place for backpackers. Would never stay here again. Worst hostel we have ever stayed in (and we have backpacked through South East Asia and stayed at some questionable places). It was dirty, the blinds in the room were broken and there was security camera outside pointing right through the window. It was SO loud. We got barely any sleep both nights from people screaming, singing and playing instruments and getting drunk. First night I got a pizza and left a few slices and put it in the fridge, when I went to get it the next day I thought a slice was missing but couldn’t be sure. The next night I got a Dominoes pizza again for my lunch the next day and left it in the fridge. I went back to retrieve it in the morning and it was gone. There were security cameras in the kitchen but when we went to the front desk to complain they said there was nothing they could do and there was no security cameras, yet there were signs all over saying security cameras in operation. Hated this place, avoid at all costs. 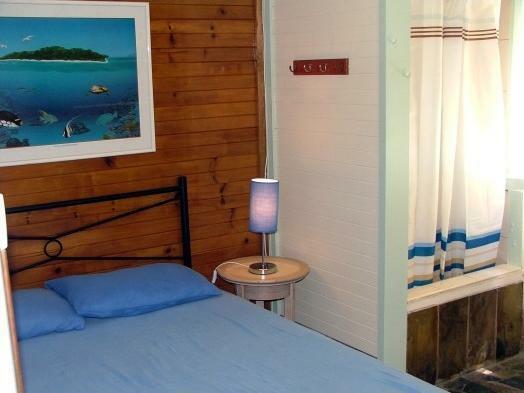 We needed simple accommodation close to town and Cairns City Backpackers was just what we needed. 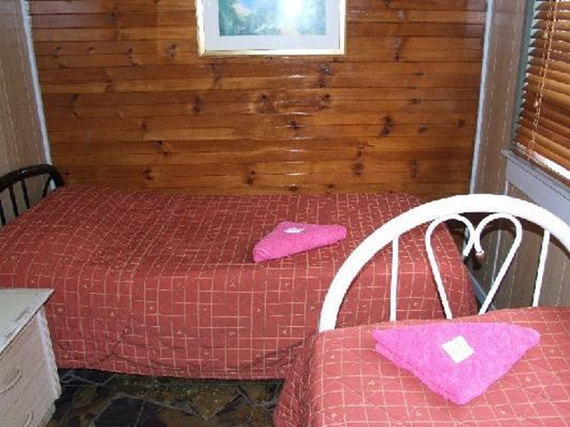 It is a no-frills place with basic rooms and has a nice ambience with friendly staff. There are 3 kitchens to prepare your own meals if you not wish to eat in town and a small pool in the backyard if you want to have a quick dip. 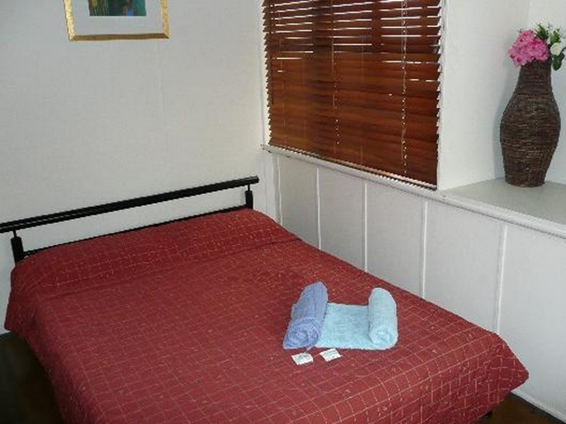 The location is within walking distance to the main centre of town and the Esplanade. Great to have found this place in Cairns! Had a great stay at Cairns City Backpackers! You get what you pay for - walking distance to the CBD, clean bathrooms and everything you need in the kitchen. Price of the hostel and the dude on reception was awesome.. fast efficient and friendly . Room was stuffy but clean- but got what i asked for which was room spray. .. massively helped. Also appreciated the aircon. Got bitten heaps by mossies in garden.. beware. Very cute accommodation, nice and friendly staff, the only thing was not really convenient is the wifi couldn't connect very well.